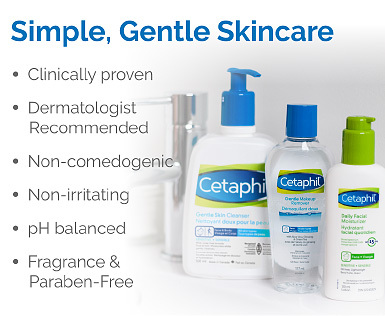 Cetaphil is a Canadian company dedicated to providing skin care products that soften skin for a healthy, smooth glow. The company supports cruelty-free research and development and has some paraben-free products on offer for those with allergies. Most of all, they’re committed to helping everyone enjoy their best skin health and beauty. Smooth on specially formulated products for dry, normal or sensitive skin types. Gentle face washes clean without making your skin itchy or irritated, while face lotions and creams hydrate without clogging your pores. Keep your hands smooth and healthy looking with healing lotions and advanced creams that may last up to 24 hours. Cetaphil pre-moistened cloths help you clean up without drying out your skin when you're on the go. Many products are available in pump-style or easy-to-open packaging. 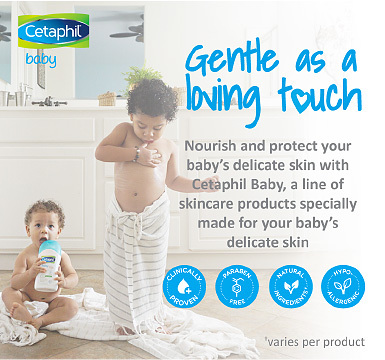 Cetaphil Baby products keep your little one's delicate skin in mind. All cleansers and wipes are designed to protect your baby and keep their skin smooth and healthy. For dry skin, turn to the moisturizing wash, and remember to lather your infant or toddler with Cetaphil lotions frequently to promote faster healing. Use the two-in-one shampoo and body wash during bath time to achieve a tear-free clean so you can concentrate on bonding with your baby. Follow up with moisturizing oil to gently exfoliate and keep your little one smelling great. Cetaphil has been producing healthy skin care products for 70 years and is committed to protecting skin at any age or any stage. Try Cetaphil creams to protect or heal your face or hands, and get Cetaphil Baby products that safeguard delicate skin. 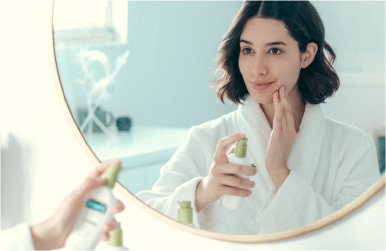 Whatever your skin care needs are, head down to London Drugs today to stock up on the complete line of Cetaphil products — a brand you can trust.